In the first of a new series, brutal politics and pitiless physics threaten an interstellar empire built on trade. The Interdependency is a group of barren planets and space stations ruled by mercantile trading houses and linked by the Flow, an extradimensional mode of travel. Occasional shifts in the Flow have cut off the Interdependency’s connection to some planets (including Earth), but it's remained relatively stable...until now. Count Claremont, a physicist stationed on the remote planet of End, has determined that the Interdependency will soon lose access to the Flow completely. Once that happens, every member of the Interdependency will be cut off from all the others by impassible light-years of distance, and a delicate web of commerce and survival will dissolve. Claremont sends his son to the Interdependency’s ruler, the Emperox Attavio IV, to share their findings before the Flow routes disappear. But Attavio IV is dying, and his daughter, Cardenia Wu-Patrick, was never intended to assume the throne. The reluctant new emperox is immediately confronted with assassination attempts and the ruthless machinations of the ambitious House of Nohamapetan, whose members seem to have their own knowledge of the radical change in the Flow. 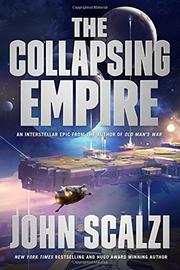 Readers might wonder whether Scalzi can write another space opera that shares the elements that made his Old Man’s War series (The End of All Things, 2015, etc.) so popular but be sufficiently different to feel fresh. Both include political plotting, plenty of snark, puzzle-solving, and a healthy dose of action, but there’s just enough here that’s new for this to avoid becoming a retread. There’s nothing groundbreaking, but you’ll still want to find out what happens next. Scalzi continues to be almost insufferably good at his brand of fun but think-y sci-fi adventure.